We get it. You want to pretty up your floor, but you don’t want to spend a ton of cash. An Epoxy paint flooring may seem like a great alternative, but are you really getting the protection you need? The truth is that a simple Epoxy Paint coating just won’t stand up to the wear and tear of constant use. For restaurants, kitchens, clinics or any other high-traffic spaces, you’ll soon find that the little money you saved using Epoxy Paint is costing you! Epoxy Paint is made for quick-fixes. You don’t need to hire an expensive contractor for its application. When applied correctly, it’s non-porous, chemically resistant, and easy to clean. Applying Epoxy Paint can be tricky, however. The surface must be properly prepared or the paint will not adhere. During the curing process Epoxy Paint is especially vulnerable to heat fluctuations. If the temperature changes or the paint is not mixed properly, tiny bubbles can form in the formula. These bubbles, despite their miniature size, can trap microbes, bacteria or fungi. All this contributes to the biggest downside of an Epoxy Paint flooring: it’s not built to last! The thinning solvents used to mix the paint might save you a few bucks on extra product, but thinners weaken its durability. The veneer quickly becomes brittle and dry, prone to cracks and lesions. You’ll find yourself needing to redo your entire flooring, and you’ll be right back where you started. 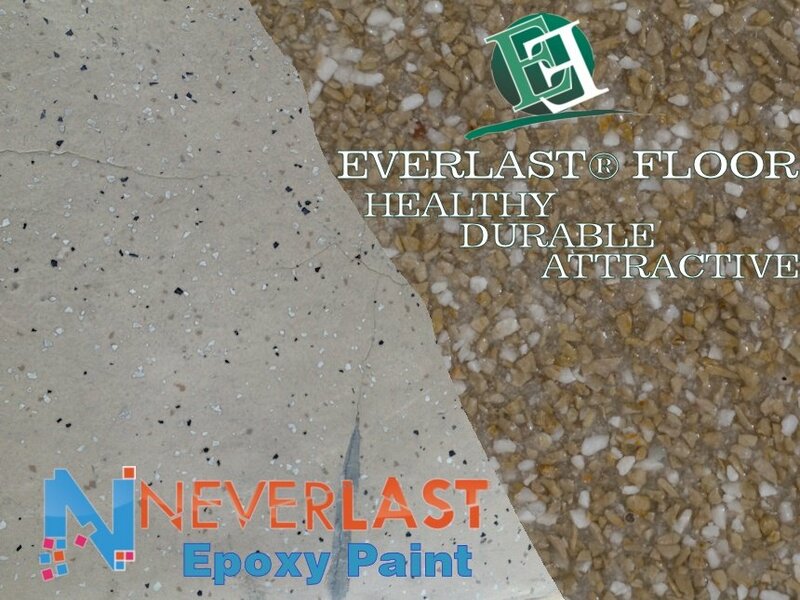 If you need all of the benefits of Epoxy Paint with none of the downsides, the Epoxy Everlast Floor is sure to work for you. At almost 100 times the thickness of Epoxy Paint, the Everlast Floor will last, well, forever. 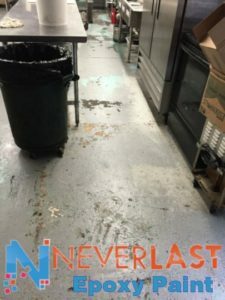 Made with an EPA approved resin that adheres to any surface, the Everlast Floor creates a sturdy membrane between your floor and the scuffs and scrapes of high traffic. Certain never to chip, crack, flake, or fracture, the Everlast Floor requires little prep and is a very easy application. Concrete, wood, tile, or VCT floor surfaces can simply be abraded and covered in the Everlast Floor mix and set to dry- your floor can be ready for high traffic in as little as 24 hours. In addition it’s 100% non-porous; bacteria and fungi have nowhere to hide. And if that’s not enough, the Everlast formula is made with an FDA-approved antimicrobial solution. Cleanup is easy, too- just use soap and water! 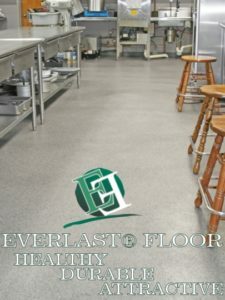 The Epoxy Everlast Floor is an excellent choice for restaurants, garages, schools, hospitals, showers, bathrooms, even freezers! Our floors can handle the roughest and toughest of treatment, from heavy equipment and temperature changes to harsh chemical corrosives.